Product code: T573 Categories: Sold Items, Sold Rings. 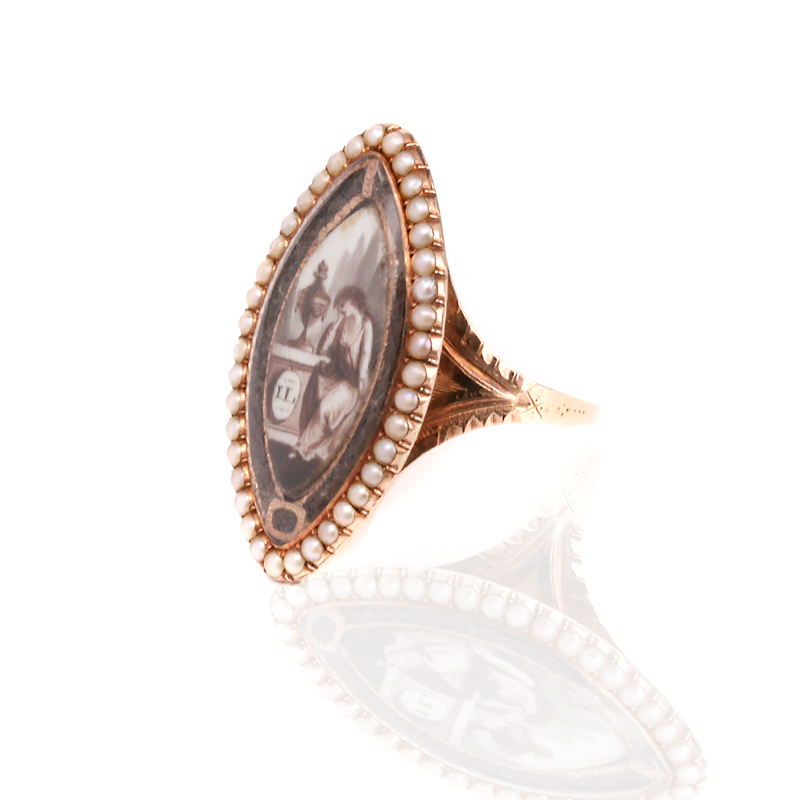 Mourning jewellery was used to remember the passing of a loved one and should not be looked upon as morbid, as years ago it was really the only way someone could keep something close to them and here is an incredible Georgian era antique mourning ring made in 1783 coming soon. As far as quality of mourning rings go, this one is one of the finest to be found and in such incredible condition even well after 220 years has passed. 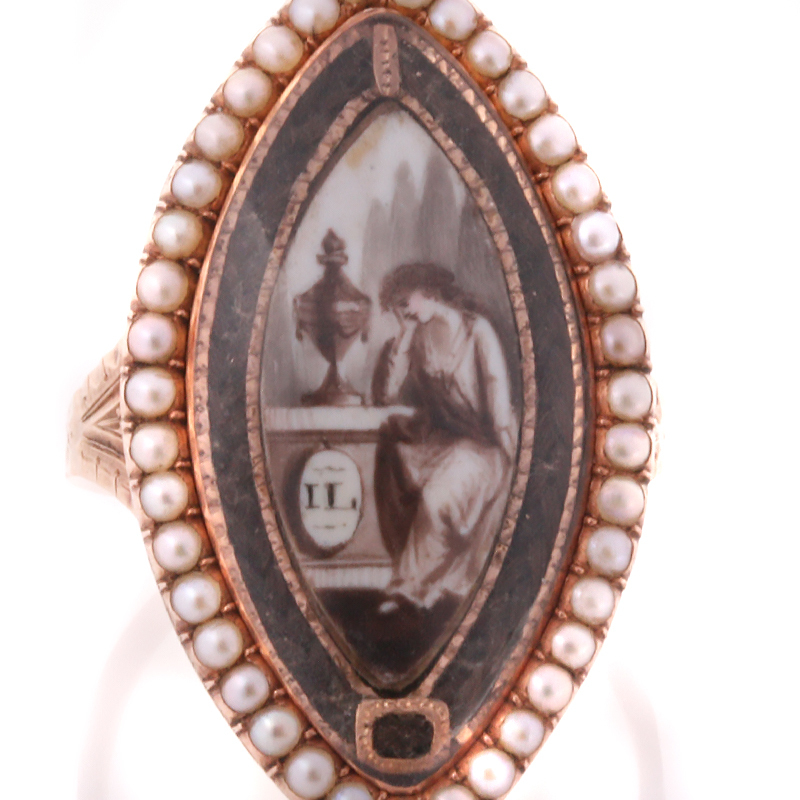 The detail and craftsmanship of this antique mourning ring is just incredible and in the centre is a scene of a woman in mourning with her arm resting on a pedestal which a traditional urn sits upon. The way the artists hand painted the woman sitting in that pose really is very beautiful and the sepia colour goes so well with the colour of rose gold. Then there is an incredible feature to this ring that is made all the more amazing that it has survived intact all these years – the border of entwined hair. Between the painted scene and the border of pearls there is a section of hair that has been entwined so beautifully and expertly and then set into a channel where it has remained in perfect condition to this day. Both the hair and the painted image are protected under rock crystal which itself is in excellent condition and has stood up all this time to protect the ring. Following the border of the ring are thirty nine natural pearls seem to frame the ring so majestically and add that extra charm to an already incredible mourning ring. The lozenge section measures 18.3mm across by 31.2mm and sits so well on the finger and the band itself is also highlighted with the most gorgeous hand engraving on the sides. And then turning the ring over and looking underneath, it is hand engraved with “Doctor James Lorrimer 25th Novem 1783” which then adds such a more personal touch to this ring. This antique mourning ring from the Georgian era is up there with the best of the best and will always be admired and appreciated by any connoisseur of fine antique jewellery.